The Brothers of Elvin E. Helms No. 926 met in Stated Communication on May 9, 2017. Our Worshipful District Deputy Grand Master Kevin Schneider of Bradford No. 123 was our guest speaker for the evening. 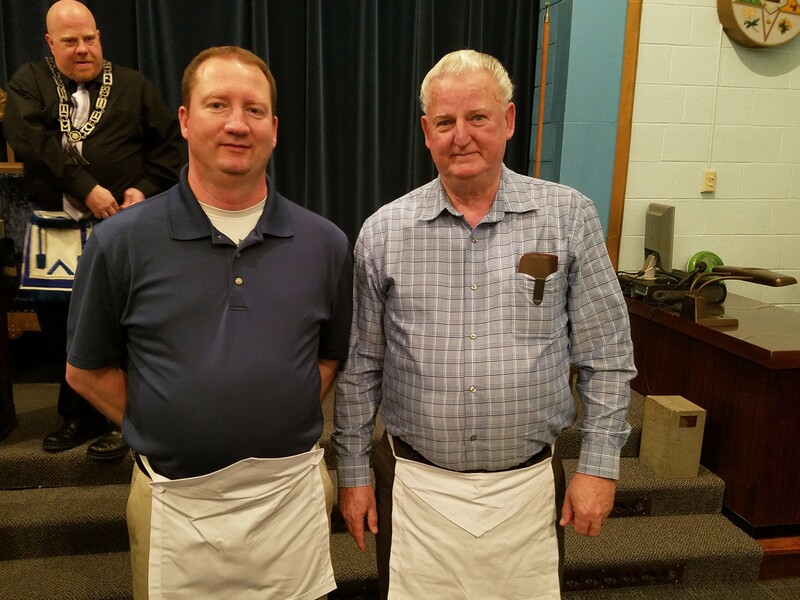 Pictured above, left to right: Kevin Schneider, District Deputy Grand Master, District 18, Grand Lodge of Kentucky; Worshipful Master Buddy Wallace. An Operative mason’s term for a stone that has been freed from the rubble that surrounds it, so that it can be taken to the building site -and- if selected be worked on. A stone that is free of enough major imperfections that it can be worked by the builder to become suitable for use in the building. In speculative masonry the rough ashlar is a man who has been examined, he has been found free of major flaws. He is “accepted” to become a stone for our building. Once the rough ashlar is being worked on, it is referred to as the common ashlar. Any man who has undergone out initiation is a common ashlar. In our degree progression, this is a Brother who has been initiated. He should be acceptable to us all even if he did nothing to change himself. However, our ritual directs him (us) to actually undergoing the transformation that occurs from using the working tools of an EA. An ashlar that has been raised to the proper height and has been set into its final place within a structure. An ashlar that is completely suitable for the builder’s use. It is ready in its own right to be a part of the build. This is a Brother who has completed the EA work and is an upright man and Mason when viewed externally and internally. This is a Brother who is considered a proficient EA. An ashlar which has been further adjusted by the Working Tools of the fellow. Stones that bound together to complete the building. Only perfected, true, and properly positioned stones are use because they can be most easily and permanently cemented together. Tonight I want to focus on the Perfect Ashlar. The question is: Do we ever become a perfect ashlar? If so, when? Your thoughts? “to bring to full development,” late 14c., parfiten, from perfect (adj.). The word “perfect” that we knock around so much in theological and biblical discussions is often misunderstood. We tend to apply an unqualified philosophical meaning to it and have it mean “without flaw” or “without error” or put it into other absolute categories. It then becomes easy to say that Jesus’ command in the Sermon on the Mount (Matt 5:48), “Be therefore perfect, even as your heavenly Father is perfect,” is a laudable goal, but one that is impossible for human beings to achieve. That is even easier to do from certain doctrinal or theological positions that assume human beings cannot ever respond to God beyond their contaminated sinful nature (see Body and Soul). 4:13 until all of us come to the unity of the faith and of the knowledge of the Son of God, to maturity, to the measure of the full stature of Christ. Here the word translated “maturity” is the word teleios, which is the same word translated “perfect” in Matthew 5:48: Be perfect, therefore, as your heavenly Father is perfect. So part of the problem is this: we confuse “perfect” to mean flawless, instead of mature or healthy. So at what point in our masonic lifetime are we considered mature? I point you to the three ages of man as pointed out by our ritual. We are considered “adults” as Fellowcraft. What point are we considered suitable so that we can be adjusted to fit in with our Brethren? At the end of the EA. We are adjusted, as it references in the degrees, by the Plumb, the Square and the Level. The EA degree is about “perfecting ourselves”. The Fe degree is about adjusting ourselves to fit others, so that we can be raised. And only after we are “tried” and found “true” with others can we be cemented together. Our process of improving a man requires us to only admit the best men to our lodges. Why? Think about the nature of the EA working tools, the 24″ gauge and the gavel. And if we add in the “missing tool” from our continental brethren, the difference becomes more obvious. That being the chisel? In operative masonry, what are these tools used for? In speculative, how are they used? The working tools of the EA teach us to remove excess stuff. The compasses in the EA teach us to limit ourselves. Even the four cardinal virtues when fully analyzed teach us limiting behaviors. So I ask you one final question tonight Brothers. Is there any part of our lodge’s maturing and improvement process that adds to the man?? If our tools only remove the bad stuff, then perhaps that explains why the “common ashlars” that we select for our lodges must be high quality men who are truly prepared when they come to our worksite. I want to thank Dr John Nagy, the author of the BBB series, for allowing me to use the reference about the 7 Kinds of Ashlars. I want to thank WB Kemble for inviting me tonight. Thank you to the WM for allowing me to have this time. And finally thanks to all of you here tonight for your attention and participation. I hope you found this useful. Though the initiation rituals of Freemasonry are universal with slight variation according to various Grand Lodge jurisdiction, most American lodges fail to incorporate one of the oldest traditions utilized to prepare candidates through the use of the chamber of reflection. 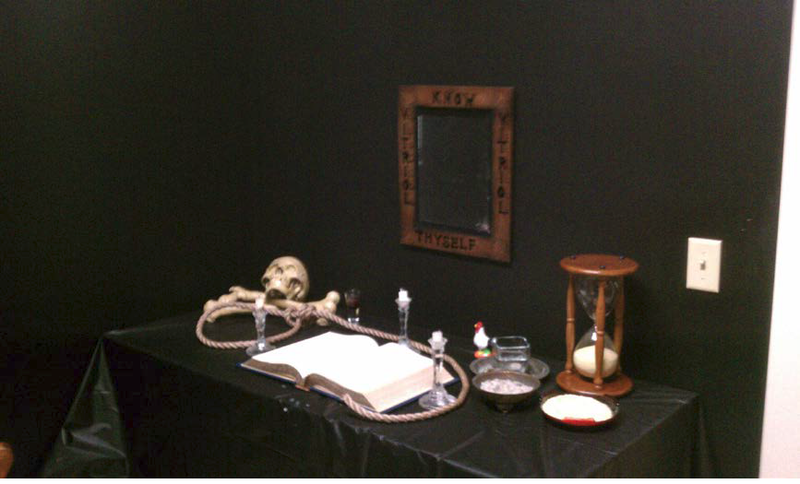 Prior to 2009, the majority of Masons in the United States were unaware of the use of the chamber of reflection as an accepted preparation practice for the degrees. The chamber of reflection was not a phrase common to pop culture, or even a part of American Freemasonry. However, thanks to author Dan Brown and his best-selling thriller The Lost Symbol, it has become a growing trend in many American Masonic lodges. Those Freemasons who are members of the York Rite, more especially the Commandery, are tacitly familiar with the chamber of reflection. Yet, even these degrees provide scant explanation in any of the rituals. Somewhere in the transition towards a modern American society, the true intent of the chamber of reflection vanished into the mist of antiquity. It is the purpose of this author to explore the history, protocol, and traditions of the chamber of reflection. While traveling to several Grand jurisdictions in several different countries, I discovered that the chamber of reflection is very much alive where it has been continually practiced for years. Most of the brethren who received their initiations in Europe, Mexico, Central and South America, Middle East and Africa will be acquainted with the chamber of reflection. Lastly, the practice may be found in the degrees in the Ancient and Accepted Scottish Rite, the French Rite, the Brazilian Rite and other rites derived from those listed. In The Lost Symbol, a fictional thriller involving the Freemasons, Dan Brown introduces to the reader one of Freemasonry’s greatest initiatory tools – the chamber of reflection. There is great meaning in the chamber of reflection. A Mason can quietly meditate upon the individual meanings of the contents in the chamber, while reflecting on his purpose for joining, and becoming a better man. More importantly, it removes the candidate from the rest of the membership, who might tease the candidate and advise him to beware of the goat. Throughout my travels in a number of Masonic jurisdictions around the world, I recognized the great importance of this tradition, which has been used for centuries in worldwide Freemasonry. The chamber of reflection should be used prior to each of the three degrees. Every practicing Mason should propose to his respective grand lodge the restoration of the traditional chamber of reflection. This is an important custom that should be restored to every lodge thus allowing the candidate to participate in a True Masonic Experience. YOU ARE NOW SEATED IN THE CHAMBER OF REFLECTION, WHERE, IN SILENCE AND SOLITUDE, YOU WILL HAVE OPPORTUNITY FOR MEDITATION. YOU ARE HERE BECAUSE YOU DESIRE TO ENTER THE REALM OF FREEMASONRY. THESE DEGREES WILL INCULCATE THE CARDNAL VIRTUES, AS WELL AS THE PRINCIPLE TENETS OF OUR ORDER. YOU ARE IN THIS CHAMBER TO GIVE YOU A FEW MINUTES TO REFLECT ON WHY YOU ARE HERE FROM YOUR OWN PERSONAL PERSPECTIVE. REFLECT ON THE EXPECTATIONS YOU HAVE, THE BENEFITS YOU HAVE TO GAIN AND CONTRIBUTIONS YOU CAN OFFER THE LODGE IN RETURN. WHILE THE WORLD IS SHUT OUT, MEDITATE UPON THESE THINGS, AND PREPARE YOUR HEART FOR THE SOLEMN CEREMONIES THROUGH WHICH YOU WILL BE CALLED TO PASS. 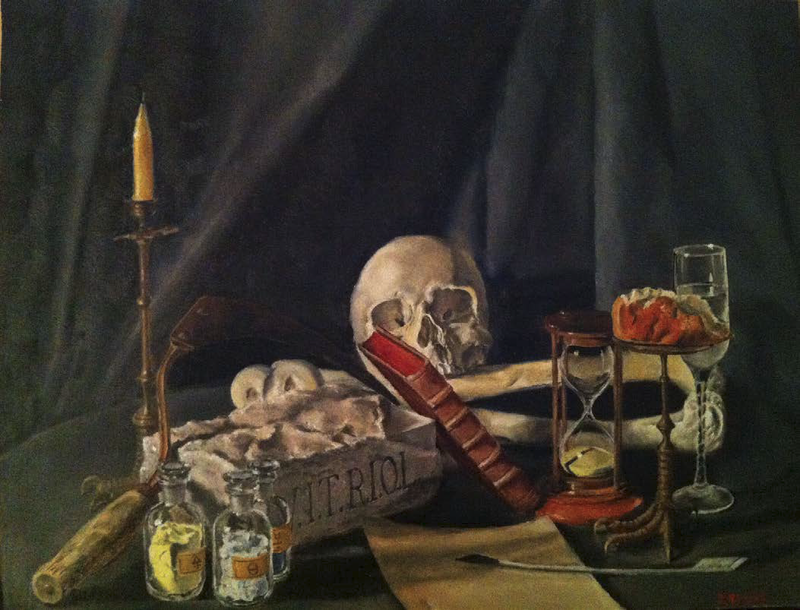 THERE LIES ON THE TABLE BEFORE YOU A MELANCHOLY MEMENTO OF MORTALITY. BESIDE IT IS AN HOUR GLASS, WHICH I NOW REVERSE. (Done.) AS YOU BEHOLD ITS SLOWLY-FALLING SANDS, LEARN THAT SO SURELY ARE THE WASTING SANDS OF YOUR MORTAL LIFE RUNNING OUT TO DEATH. THERE IS ALSO ON THIS TABLE THE HOLY BIBLE, WHICH IS OPENED TO PSALM 133. I ENJOIN UPON YOU AT THIS TIME THE READING OF THE VERSES INCLUSIVE OF THAT CHAPTER. WHEN YOU SHALL HAVE CONCLUDED THE READING YOU WILL DISCOVER SOME QUESTIONS, TO WHICH YOUR EXPLICIT ANSWERS ARE REQUIRED IN WRITING. REFLECT ON THEM, AND THEN ANSWER EACH WITH A SIMPLE “YES” OR “NO,” ACCORDING TO THE DICTATES OF YOUR CONSCIENCE. THEN SIGN YOUR NAME, IN FULL, TO EACH OF THEM. YOU ALSO FIND THAT THERE ARE SOME ARTICLES OF CLOTHING , YOU WILL REMOVE ALL METALLIC SUBSTANCES ABOUT YOUR PERSON, REMOVE YOUR CLOTHING AND PUT ON WHAT IS PROVIDED FOR YOU. I AM NOW ABOUT TO LEAVE YOU ALONE, AND WILL SIGNAL MY DEPARTURE BY THREE KNOCKS UPON THE DOOR, HEARING THEM, YOU WILL REMOVE THE HOODWINK AND PROCEED AS I HAVE DIRECTED. WHEN YOU SHALL HAVE CONCLUDED, GIVE THREE KNOCKS AND I WILL ATTEND YOU. THERE IS ALSO ON THIS TABLE THE HOLY BIBLE, WHICH IS OPENED TO AMOS 7. I ENJOIN UPON YOU AT THIS TIME THE READING OF THE VERSES INCLUSIVE OF THAT CHAPTER. YOU ARE HERE BECAUSE YOU DESIRE TO ENTER THE REALM OF FREEMASONRY. THIS DEGREES WILL INCULCATE ALL VIRTUES OF THIS ORGANIZATION, AS WELL AS THE PRINCIPLE TENETS OF OUR ORDER. YOU ARE IN THIS CHAMBER TO GIVE YOU A FEW MINUTES TO REFLECT ON WHY YOU ARE HERE FROM YOUR OWN PERSONAL PERSPECTIVE. REFLECT ON THE EXPECTATIONS YOU HAVE, THE BENEFITS YOU HAVE TO GAIN AND CONTRIBUTIONS YOU CAN OFFER THE LODGE IN RETURN. THIS DEGREE REMINDS THAT WE ARE IMORTAL AND THAT ONE DAY , WE WILL CESE TO EXIST. 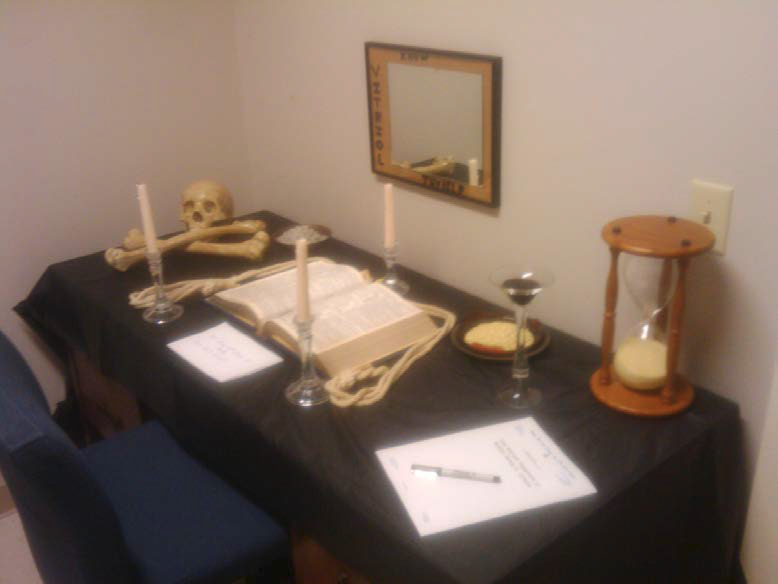 THERE IS ALSO ON THIS TABLE THE HOLY BIBLE, WHICH IS OPENED TO ECCLESIASTES CHAPTER 12. I ENJOIN UPON YOU AT THIS TIME THE READING OF THE VERSES INCLUSIVE OF THAT CHAPTER. WHEN YOU SHALL HAVE CONCLUDED THE READING YOU WILL DISCOVER YOUR LAST WILL AND TESTAMENT. REFLECT ON THIS, AND THEN COMPLETE IT ACCORDING TO THE DICTATES OF YOUR CONSCIENCE. THEN SIGN YOUR NAME, IN FULL. 1 Dan Brown, The Lost Symbol (New York: Doubleday, 2009), 149-160. 2 Daniel Beresniak, Symbols of Freemasonry (London: Assouline, 2000), 22-25; Allen Roberts, The Craft and Its Symbols (Richmond: Macoy), 13; “Initiation,” Coil’s Masonic Encyclopedia (Richmond: Macoy, 1995)327. 3 Albert Pike, The Porch and the Middle Chamber (Kessinger Publishing), 5-13; Christopher Hodapp, Deciphering the Lost Symbol (Berkley: Ulysses press, 2010), 72-73. 4 Giordano Gamberini, Codice Massonico Delle Logge Riunite E Rettificate Di Francia (Foggia: Bastogi, 1778), 16-51; Daniel Beresniak, Les Symboles de Francs-Macons (Paris: Assouline, 1997), 24-30. 5 Cliff Porter, The Secret Psychology of Freemasonry (Colorado Springs: Starr Publishing, 2011), 128-170; Andrew Hammer, Observing the Craft ( Mindhive Books, 2010), 101-102. 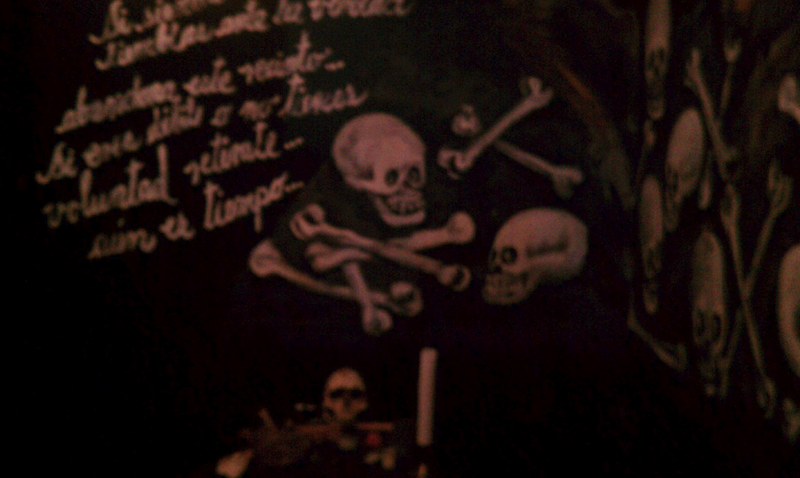 6 “Skull and Crossbones,” Coil’s Masonic Encyclopedia (Richmond: Macoy, 1995),623; Hodapp, Deciphering,, 52-53,72-73; Porter, Secret Psychology, 128-170; Mark O’Connell, and Raje Airey, The Complete Encyclopedia of Signs & Symbols (Hermes House), 159; Hammer, Observing the Craft, 100-110. 7 “Hourglass,” Coil’s Masonic Encyclopedia (Richmond: Macoy, 1995), 623; Hodapp, Deciphering,,72-73; Porter, Secret Psychology, 128-170; Monitor of the Lodge, Grand Lodge of Texas, A.F. & A.M. (Waco, TX: Waco Printing Co., 2010), 85; Hammer, Observing the Craft, 100-110; O’Connell and Airey, Signs & Symbols,159, 229 . 8 “Communion,” Coil’s Masonic Encyclopedia (Richmond: Macoy, 1995), 143; Hodapp, Deciphering,,72-73; Porter, Secret Psychology, 128-170; Hammer, Observing the Craft, 100-110. 9 Beresniak, Symbols of Freemasonry, 22-25. 10 Lewis Spence, The Encyclopedia of the Occult (London: Bracken Books, 1988), 9-13; Hammer, Observing the Craft, 100-110; Hodapp, Deciphering,,72-73; Beresniak, Symbols of Freemasonry, 22-25; Porter, Secret Psychology, 128-170; Beresniak, Les Symboles de Francs-Macons, 24-30; O’Connell and Airey, Signs & Symbols,146-147, 206 . 13 Manual de Aaprendiz Macom Segundo o Ssistema do Rito Brasilero. (Brasilia: Grande Oriente do Brasil, 1986) ; Hodapp, Deciphering,,72-73; Beresniak, Symbols of Freemasonry, 22-25; Porter, Secret Psychology, 128-170; Hammer, Observing the Craft, 100-110; Beresniak, Les Symboles de Francs-Macons, 24-30. 14 M. O’Connell and R. Airey, Signs & Symbols,144-147, 206 ,227-233, 240-244; Hodapp, Deciphering,,72-73; Beresniak, Symbols of Freemasonry, 22-25; Porter, Secret Psychology, 128-170; Hammer, Observing the Craft, 100-110; Beresniak, Les Symboles de Francs-Macons, 24-30 . 15 Gamberini, Codice Massonico,16-65; Hodapp, Deciphering,,72-73; Beresniak, Symbols of Freemasonry, 22-25; Porter, Secret Psychology, 128-170; Hammer, Observing the Craft, 100-110; Beresniak, Les Symboles de Francs-Macons, 24-30; O’Connell and Airey, Signs & Symbols, 92-95, 234 . 16 Gamberini, Codice Massonico,16-65; Hodapp, Deciphering,,72-73; Beresniak, Symbols of Freemasonry, 22-25; Porter, Secret Psychology, 128-170; Hammer, Observing the Craft, 100-110; Beresniak, Les Symboles de Francs-Macons, 24-30; “Chamber of Reflection,” Coil’s Masonic Encyclopedia (Richmond: Macoy, 1995),127; “Chamber of Reflection,” Albert G. Mackey, An Encyclopedia of Freemasonry, ed., rev. and enl. By Robert L. Clegg, 2 vols ( Chicago: Masonic History, 1929), 1 190; “Chamber of Reflection,” Robert Macoy, A Dictionary of Freemasonry(New York: Gramercy Books, 1989), 106 . 17 Jachin and Boaz (London: W. N. Coll, 1762); Perau, M. L’abbei, L’Ordre des Francs-Macons Trahi, et Le Secret des Mopses Revele'(AAnsterdam, 1745). 18 S. Brent Morris, The Folgers Manuscript, ( Illinois: The Masonic Book Club, 1992) 179-200, xv-xxviii; Stephen Dafoe, Morgan (New Orleans: A Cornerstone Book, 2009)45-124. 19 Dafoe, Morgan, 45-124; Morris, Folgers Manuscript, 1992. 20 Arturo De Hoyos & Brent Morris, Committed to the Flames (London: Lewis Masonic, 2008), 181-186, 193-195. 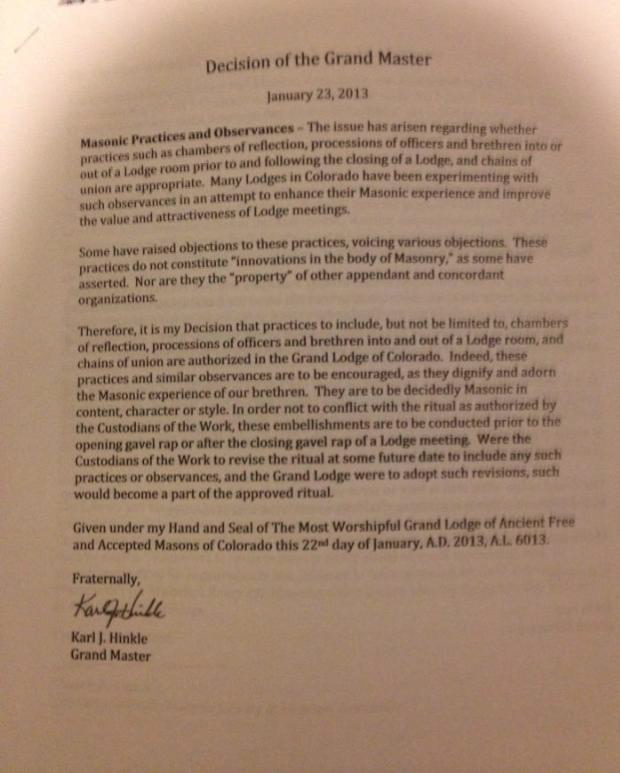 21 Grand Masters Decision, Grand Lodge of Colorado (Appendix H). 22 The Laws of the Grand Lodge of Texas, A.F. & A.M. (Waco, TX: Waco Printing Co., 2011). Published by permission of the author and the Texas Lodge of Research. The Brothers of Elvin E. Helms No. 926 met in Stated Communication on Tuesday, April 11, 2017. Worshipful Brother John Cissell of Buechel No. 896 traveled to Petersburg to be our guest speaker for the evening. The topic was Circumambulation. 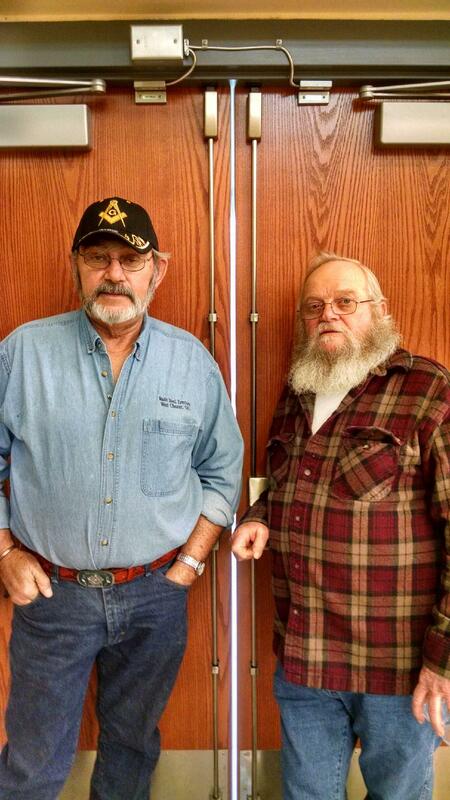 Pictured above, left to right: Worshipful Master Buddy Wallace, Worshipful Brother John Cissell. Good evening Brothers. It is a personal pleasure to be invited to speak to you this evening and I will be addressing a subject that I hold in high regard. Before we get started, I’d like you to consider the central question of the evening. Why do we perform ritual and do we understand the symbolism of the ritual we perform? When asked, almost all Brothers can tell you that the badge of a Mason is his apron. Many will tell you that which makes him a Mason is his obligation, and most can tell you the purpose of the working tools of each degree. Some can recite for you the uses of Chalk, Charcoal and Clay, or the symbolism of the beehive or pot of incense. A gifted few can deliver the mountainous Stair Lecture in its eloquent explanations of the various forms of architecture and the liberal Arts & Sciences. I am not going to spend our time here this evening pealing apart one of those worthy subjects however. This evening I am going to ask you to consider one of the most often overlooked components of our ritual. 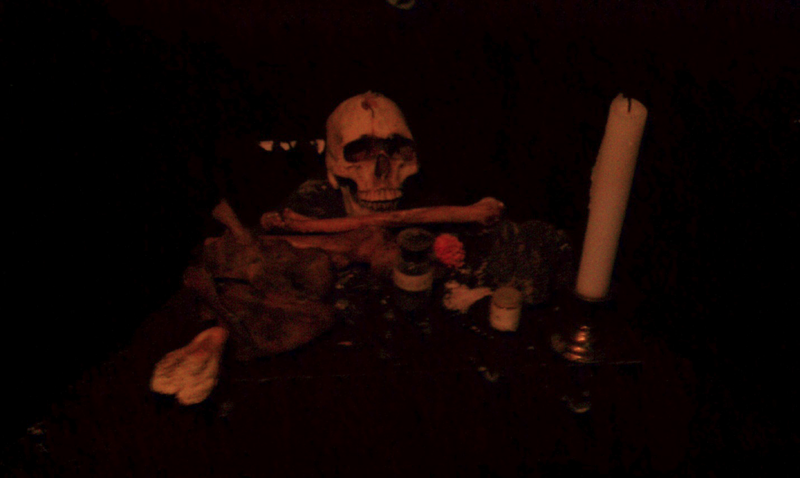 And while this small piece of ritual may seem trivial as we take the first step in considering it, I ask that you keep an open mind to the very nature of esoteric initiation, which is what our ritual truly is. This evening we are going to consider the very steps taken about the altar during the conduct of all ritual, and what those steps represent. Circumambulation – the noun, or Circumambulate – the verb, from the Latin Circum (around) and Ambulare (to walk) Merriam-Webster defines as to circle on foot, especially ritualistically. Oxford defines it as the act of moving around a sacred object or idol. Though the Etymology of the word dates to ancient times, its first known usage occurred in 1606. It is believed that the circumambulation dates to ancient times, prior to all, or at least most of the current concepts of religion going back to the time when humankind worshipped the sun and other forces of nature. Both the Greeks and Romans are known to have circumambulated their sacred objects. Ritualized circumambulation occurs today in many of the world’s religions and is an integral part of Hinduism and Buddhism in Eastern religions as well as Christianity, Judaism and Islam. Circumambulation occurs in both Sunwise (clockwise) and Widdershins (counter-clockwise) motions. 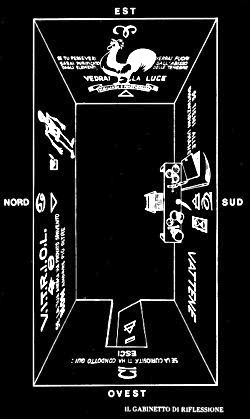 Masonic Circumambulation occurs Sunwise, with the Altar always to the Right. While we do not know with certainty how the act of circling the Altar first became part of the rituals of Masonry, many speculate that the practice began during the Operative roots of the Craft and was intended to allow for a proper inspection of new candidates for physical deficiency or inadequacy. While we cannot know with certainty the when or why, we can explore the meaning and the symbolism associated with the Rite of Circumambulation in Freemasonry. Masonic Scholar Carl Claudy, in his book Introduction to Freemasonry states “Among the first religions were sun and fire worship. Prehistoric man found God in nature…Worship of the sun in the sky was done symbolically by worship of fire upon piles of stones which were the first altars….Early man imitated the God he worshiped. Heat and light he could give by fire, so lighting the fire on the altar became an important religious ceremony. And early man could imitate the movements of his God.” Most ritualistic circumambulation occurs in a clockwise motion, from East to West through the South following the movement of the sun across the sky as observed in the Northern hemisphere. As early man worshipped the sun, the procession was not just a physical act, but a mystical one as well. Brother Mackey wrote that circumambulation “had a reference to the motion of the heavenly bodies, which according to the ancient poets and philosophers produced a harmonious sound, inaudible to mortal ears, which was called ‘the music of the spheres.’” As humankind evolved from worshiping nature to polytheism, henotheism (the worship of a single god while not denying the existence or possible existence of other deities) and monotheism the rite of circumambulation necessarily took on new meaning. No longer simply an act of imitation, circumambulation became an act of purification made possible through the structured proximity to the holy. Many Observant lodges in America, and most European lodges execute the Officer’s Procession, whereby the officer’s enter the lodge in a solemn line and proceed about the Altar before assuming their appropriate stations. In the 18th and 19th centuries, The Senior Deacon would frequently travel from his station to the Secretary’s desk to retrieve the Volume of Sacred Law, and then proceed to the Altar to display the Great Lights appropriate to the degree being worked. The entire time, the Senior Deacon would keep the Altar on his right side. At the end of the meeting, he would follow the same path, East through the South, approaching the Altar from the West always keeping the Altar to his right. Within the lodge room, this procession purified the profane and transformed it into the sacred space necessary to perform our initiation rites. In the stereopticon lecture (the third section) of the Entered Apprentice, we are taught that among the several decorations found within every regular and well-governed lodge of Entered Apprentices you will find a point within a circle, touching upon two parallel lines. We are taught that the point represents the individual Brother, the circle is the boundary line of duty, beyond which we are never to suffer our prejudices or passions to betray us, and that while traversing this boundary line, we necessarily touch upon the two lines and our volume of sacred law. We are also taught that for those Masons who keep themselves thus circumscribed within those due bounds, it is impossible to materially err. Like most of you, I have heard those words many times within the walls of a lodge of Entered Apprentices. In my travels, I have looked for the literal symbol just described without fail in every lodge I’ve entered, and seldom find it displayed as such. After beginning my study of the Rite of Circumambulation though, I found this symbol…..at least its esoteric representation…..in every lodge I’ve entered, be that a lodge of Entered Apprentice, Fellow Craft or Master Mason. Symbolically, the point is the Volume of Sacred Law, the parallel lines are the Master in the East and the Senior Warden in the West and finally, the circle is made by the candidate led by the Senior Deacon in procession about the Altar. By proper attention to the act of circumambulating the Altar, in reverent procession, we not only symbolically sanctify the lodge room and purify the candidate for the initiation, but we also should be reminded of our own obligation to keep our own actions and passions within due bounds. While I do not dare tell you that the Rite of Circumambulation is the most important step taken within the lodge room, nor that it is the most meaningful component to our ritual, I do want to impress upon you the weight of the procession about the Altar and draw your attention to its proper care. I am of the firm belief that through knowledge…..that knowledge of what those steps represent, we are better enabled to perform our ritual with the sincerity and gravity that it deserves. If we pay greater attention to the smallest detail……literally the meaning of the steps we take around the Altar then we almost certainly will be compelled to give greater attention to the more obvious components of our ritual. And I believe that is a path to a more enriching Masonic experience, for it is our single claim, when we answer the Masters challenge in each degree, while standing in the East for the first time, to be a traveler in search of Light. Let us shine the light of knowledge upon our ritual, and thereby elevate our appreciation for it and those who have come this way before us. I leave you this evening my Brothers with a hearty thanks for the opportunity to fellowship with and address you. I also ask you to reflect upon that central question that I opened with… Why do we perform ritual and do we understand the symbolism of the ritual we perform? 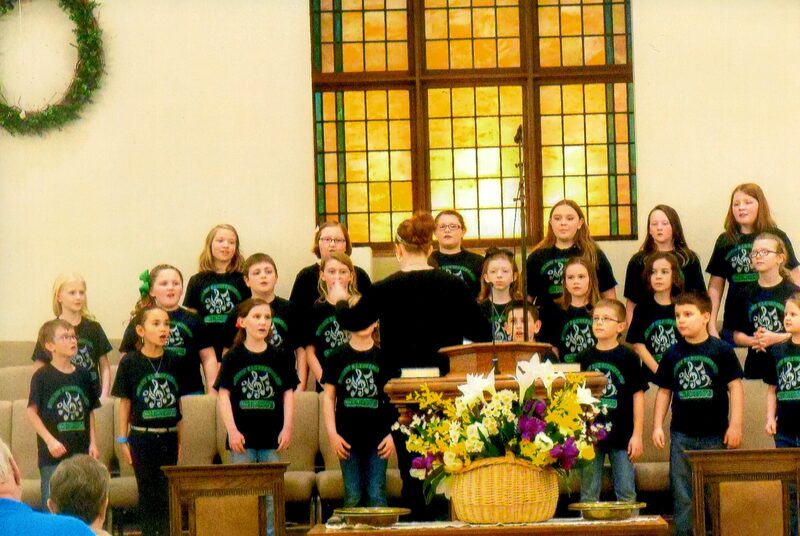 The Kelly Elementary School Chorus, under the direction of Ms. Holly Trenkamp, performed their Spring Concert on Thursday, March 30, 2017 to a full house at Belleview Baptist Church. Following the concert, Elvin E. Helms Lodge No. 926 served punch and cookies to the choir members, faculty, relatives and friends. 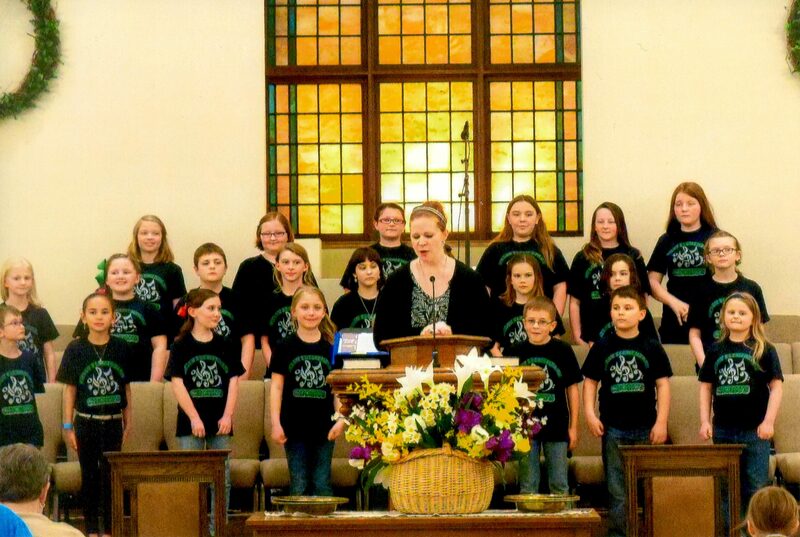 The Lodge wishes to congratulate the Choir and Ms. Trenkamp on a job well done. Thanks to all who came out to support the Choir and a special thanks to Jillian Gross for baking most of the cookies that were enjoyed by all! 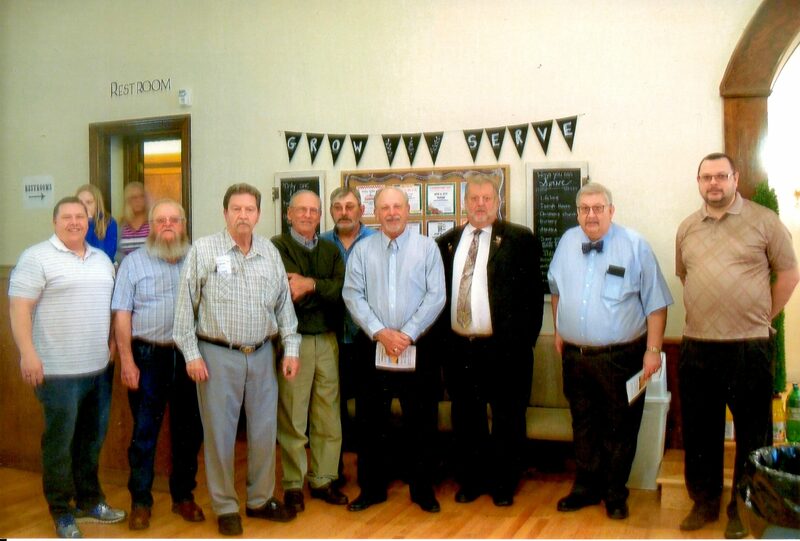 Eight members of our Lodge and one visiting Brother attended the Spring Concert. They are, left to right, Bro. Jason Wallace, Sr. Warden, Bro. Kenny Williamson, P. M., Bro. Buddy Wallace, Worshipful Master, Bro. Dennis Stephens, Jr. Deacon, Bro. Rick Campbell, Tyler, Bro. Ed Tanner, Sr., Steward, Bro. Larry York, Secretary at DeMoss Lodge No. 220 and Sr. 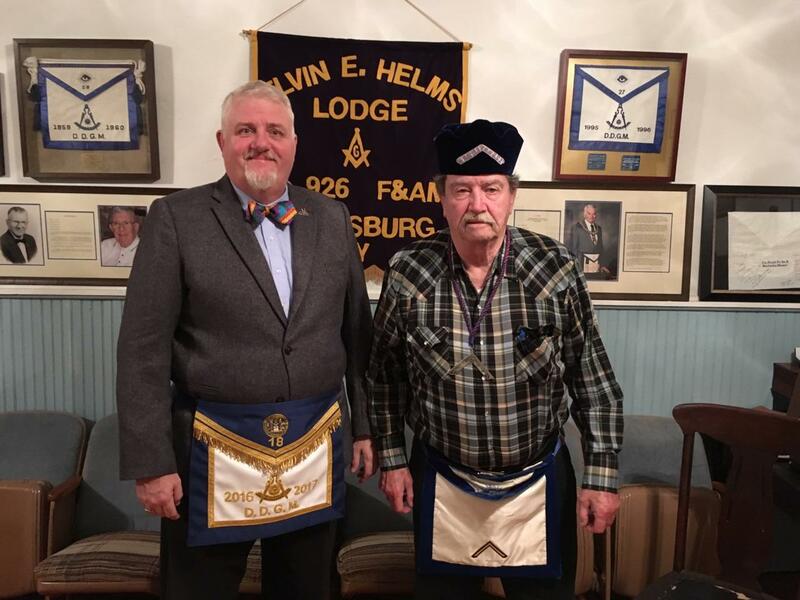 Warden at Wilmington Lodge No. 362, Bro. Dan Kemble, Secretary and Bro. Adam Gross, Jr. Warden. 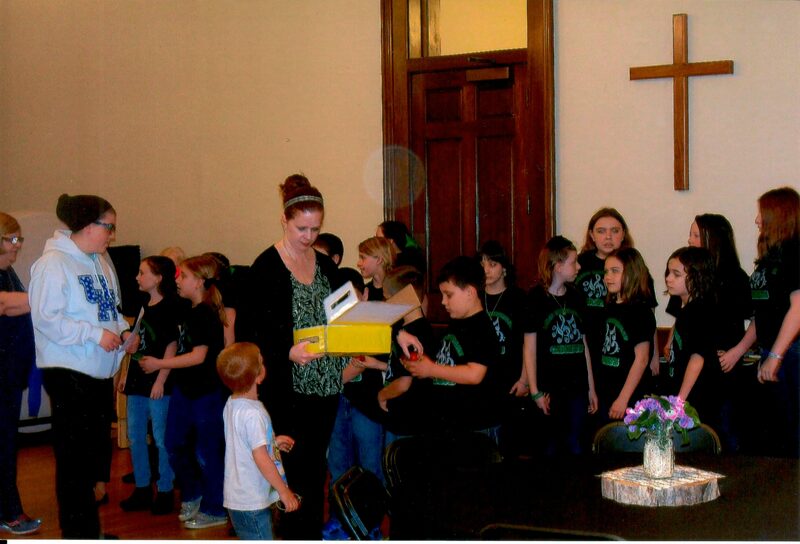 Ms. Trenkamp gets the Choir organized prior to the performance. 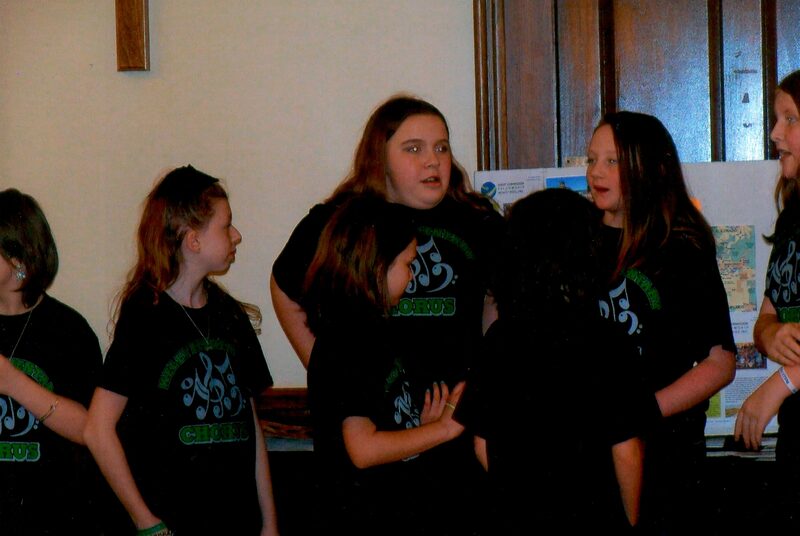 Choir members chat with each other before the performance. 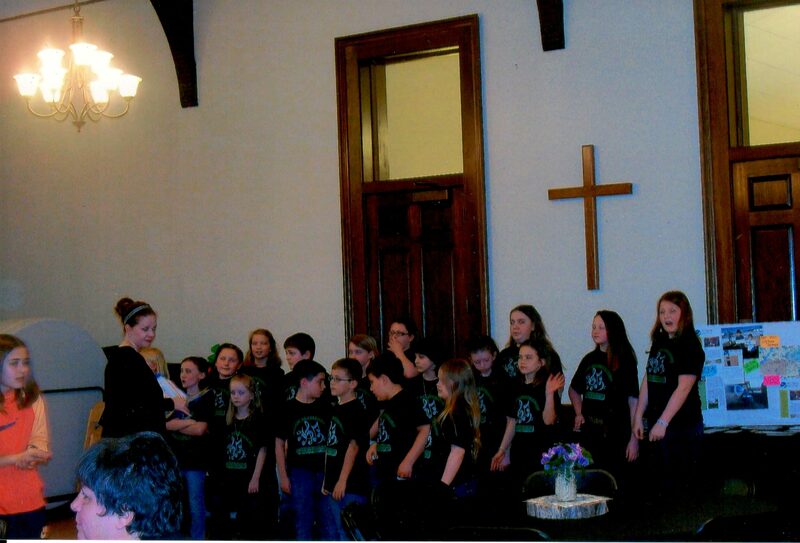 The Choir takes a quick run through prior to showtime. 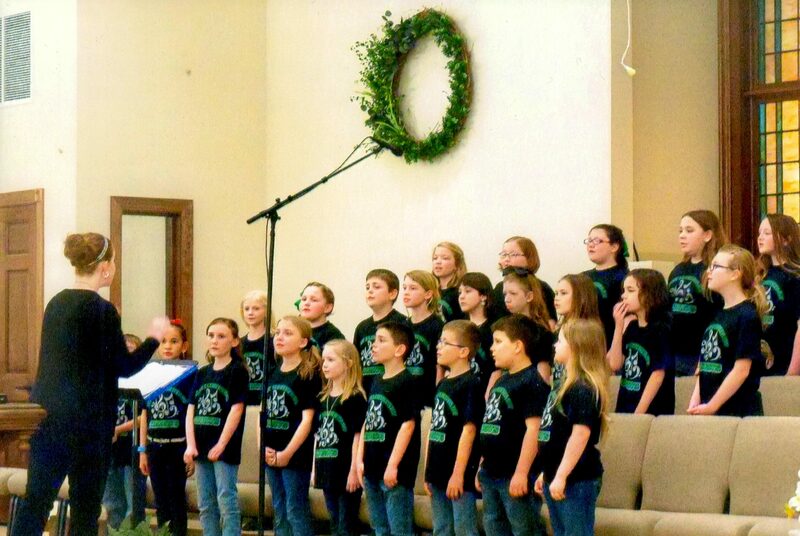 The Kelly Elementary Choir performing during their Spring Concert. Ms. Trenkamp introduces the next selection. The Choir begins their final number. Belleview Baptist Church is a beautiful venue for the concert. 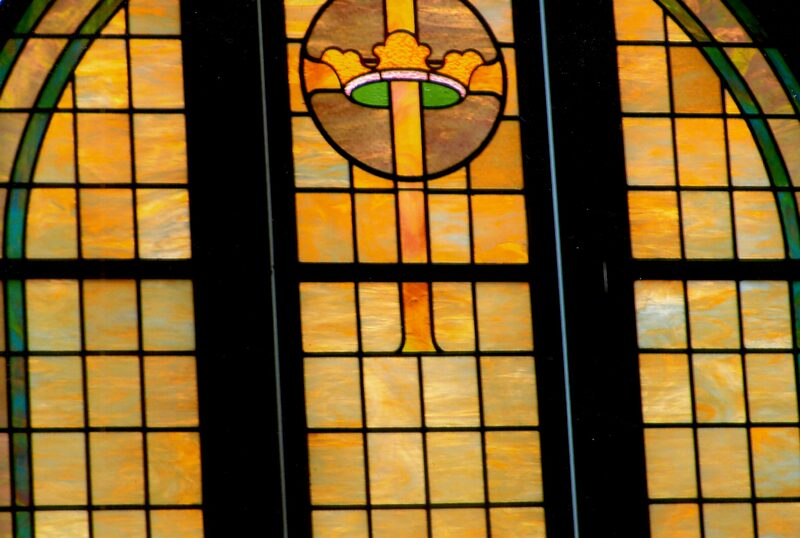 Pictured above is one of the Church’s stained glass windows. 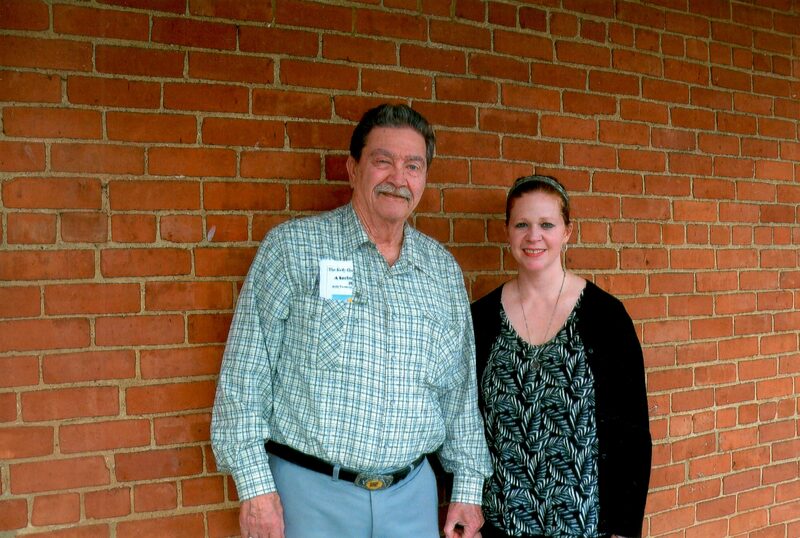 Worshipful Master Buddy Wallace and Choir Director Holly Trenkamp after the performance. The stated meeting of Elvin E. Helms Lodge No. 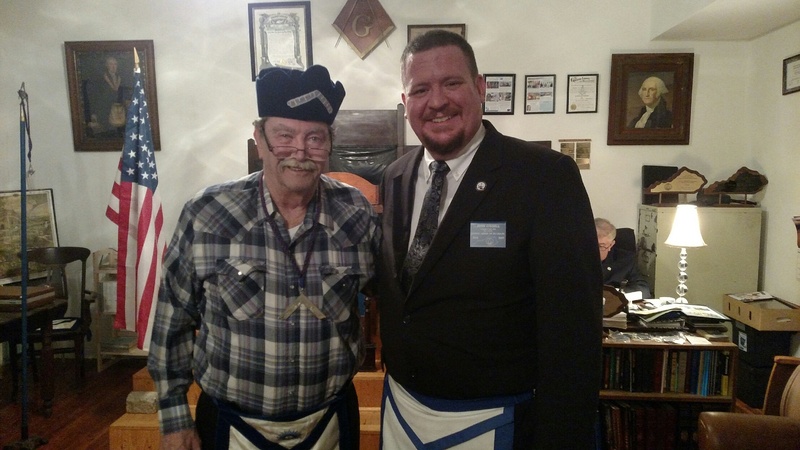 926 on March 14, 2017 saw a full house at Lodge despite Winter’s last blast of cold weather and snow. 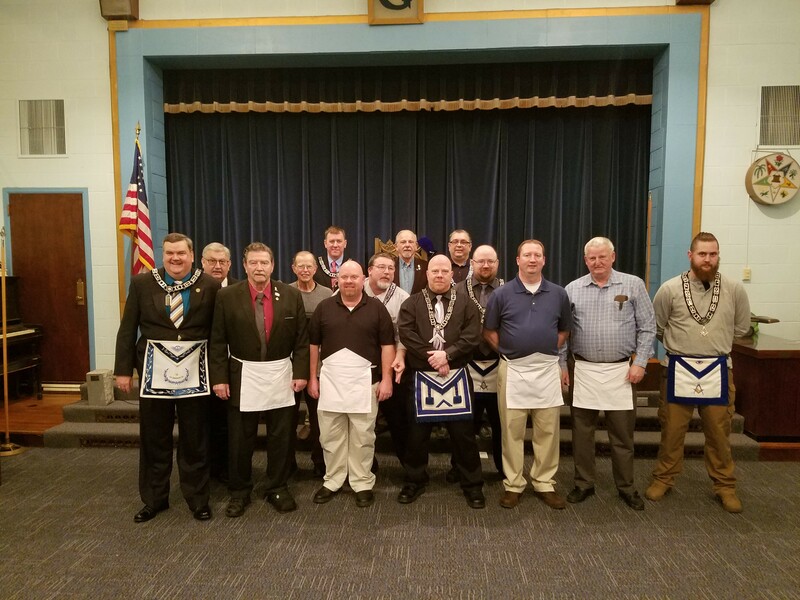 We were honored to have representatives from five other District 18 Lodges in attendance at our meeting, including four current Masters – Worshipful Bro. David Bird from Good Faith Lodge No. 95, Worshipful Bro. Joe Deck from Bradford Lodge No. 123, Worshipful Bro. Sean Weaver from Phoenix Lodge No. 719 and Worshipful Bro. Tom Cooper from Hebron Lodge No. 757. Bradford Lodge No. 123, with six in attendance, claimed the District 18 Traveling Gavel. Worshipful Bro. Eddie Hazelett, Past Master of Paintsville Lodge No. 381 and current member of the Grand Lodge of Kentucky’s Committee on Education, presented our Masonic Education for the evening. Worshipful Bro. Hazelett told the story of how Scots Masons were involved in the construction of the White House in Washington, D. C. Bro. Hazelett’s presentation was excellent and the Lodge presented him with an honorary membership in Elvin E. Helms Lodge no. 926. Click here to view Worshipful Bro. Eddie Hazelett’s presentation. We were delighted to have Worshipful Bro. Al Collier in Lodge with us again. Bro. Al has been caring for his wife, Jenny, who has been ill. Being a full-time caregiver, Bro. Al has been unable to attend Lodge. He and Jenny recently celebrated their 66th wedding anniversary. Congratulations to Bro. Al and Jenny and may they enjoy many more anniversaries. Please feel free to drop Bro. Garry a line or a card to cheer him. Our Lodge is draped in mourning to observe the death of Bro. Emmett Ralph Elliott, a 52-year member of our Lodge. Bro. Elliott died on March 3, 2017. Our next meeting is Tuesday, April 11. Please join us for a good time of food, fellowship and Masonic Education. Ralph Elliott, 90, of Crestwood, husband of Stephania Brewer Elliott, died Friday, March 3, 2017 at Hosparus Care Center in Louisville. Ralph was born in Boone County, Kentucky February 25, 1927 the son of the late Emmett & Viola Caldwell Elliott. He was a World War II Veteran having served in the U.S. Army and U.S. Navy. He then spent most of his working life in land management and disposal with the U.S. Corp of Engineers. He was also a 50 year member of Elvin E. Helms Masonic Lodge No. 926 F&AM in Petersburg, Kentucky and a longtime support of Trooper Island. Besides his wife of 44 years he leaves to cherish his memory 5 daughters, Darlene, Lisa (Todd), JaNene, Michele (Michael Noe) and Mary Jane, 3 sons, Alan (Ruth), Rob and Kenny (Rhnea), sister, Ann Brown, 11 grandchildren, 13 great grandchildren, several nieces & nephews and extended family. He was preceded in death by his granddaughter, Kerry Elliott. In lieu of flowers the family has requested memorials to Hosparus. 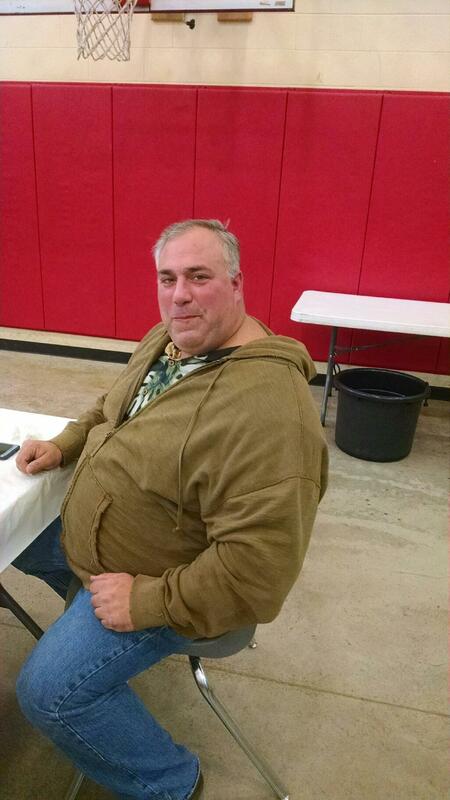 This year the David Wood Memorial Chili Cook-Off had eight entries. Chili chefs included David Bird, Debbie Bush, Travis Bush, Rick Campbell, Dave Cassesa, Lora Rodgers, Ed Tanner, and Buddy Wallace. The overall winner, and new unofficial Mayor of Petersburg for the ensuing term, was Debbie Bush, followed by David Bird in second, and Dave Cassesa in third. Traditional: Dave Cassesa, first place; Buddy Wallace, second place; Lora Rodgers, third place. Hot: Rick Campbell, first place; Travis Bush, second place; Ed Tanner, third place. Exotic: Debbie Bush, first place; David Bird, second place. Overall the David Wood Memorial Chili Cook-Off was a great success with receipts of over $1400 for the various community programs of Elvin E. Helms No. 926. Bro. Mike Moses of Boone-Union No. 304 won the split-the-pot. Our speaker for our February educational program was Worshipful Brother Dan Kemble and spoke of the Ancient Landmarks of Freemasonry. Early in one’s Masonic journey, the new Mason is confronted with the concept of the “Ancient Landmarks.” Perhaps no other topic in Freemasonry has generated so much study, so much debate and so little agreement. Landmarks are defined as objects or features of a landscape that are easily seen and recognized from a distance, especially one that enables someone to establish their location. Albert G. Mackey, the noted and prolific Masonic writer, wrote that Landmarks mark boundaries and, more in the Masonic sense, mark the boundaries between the profane world and the Masonic world. As Masons, we generally encounter the term “landmarks” twice – once when receiving the charge as a newly raised Master Mason, and again during a Lodge’s annual installation of officers. Universal benevolence you are always to inculcate, and by the regularity of your own behavior afford the best example for the conduct of the less informed. The ancient Landmarks of the Order, intrusted to your care, you are carefully to observe, and never suffer them to be infringed, or countenance a deviation from the established usages and customs of the Fraternity. Do you promise to respect genuine and true Brethren, and to discountenance imposters and all dissenters from the Ancient Landmarks and Constitutions of Masonry? But beyond these two instances, how much are we taught, and how much do we really know about the Ancient Landmarks? For the first 100 years or so following the creation of the Grand Lodge of England in 1717, little was written about the Landmarks. Anderson’s The Constitutions of the Free-Masons of 1723 says, “Every annual Grand Lodge has an inherent power and authority to make new regulations, or to alter these, for the real benefit of this ancient Fraternity; provided always that the old Landmarks are carefully preserved.” While we accept Anderson’s Constitutions as an integral part of the foundation of Freemasonry as we know it, it sheds little light on what, exactly, the ancient Landmarks are. In the 1820s, Masonic scholar, George Oliver made oblique references to the Landmarks in several of his writings, but did not specifically identify them. W. Bro. J. W. S. Mitchell, Grand Master of the Grand Lodge of Missouri, rejected Morris’s list of Landmarks, saying that “all, or nearly all” of the Landmarks were included in Anderson‘s Constitutions of 1723. M. W. Bro. Mitchell’s reading of Anderson’s Constitutions is puzzling, given its silence on specifics of the Landmarks. Morris’s list, and Mitchell’s subsequent rejection, touched off a lasting debate about the identity and nature of the Landmarks. The next Masonic scholar to weigh in on the subject was the renowned Dr. A. G. Mackey. Albert Gallatin Mackey (1807-1881) was a South Carolina physician and one of the greatest Masonic thinkers and writers of the 19th century. In 1859 Dr. Mackey published A Textbook of Masonic Jurisprudence which discusses, in great depth, Mackey’s understanding of the Landmarks. All four tests must be met for a practice or custom to be considered a Landmark. Mackey then went on to list 25 Ancient Landmarks which, in his opinion, met the four tests. Those 25 Landmarks are provided on an attached sheet. instrumental in the founding of Louisville Lodge No. 400. Bro. H. B. Grant served as Grand Secretary of the Grand Lodge of Kentucky from 1887-1912. In 1889, R. W. Bro. Grant published his list of Ancient Landmarks in the “Masonic Home Journal,” beginning in February of 1889. R. W. Bro. Grant said, “The Ancient Landmarks of Freemasonry are the immemorial usages and fundamental principles of the Craft and are unchangeable.” Note the similarity to Mackey in the use of the terms immemorial (existing since antiquity) and unchangeable. Right Worshipful Bro. Grant then proceeded to list 54 Ancient Landmarks of the Craft. These Landmarks can be found in Bro. Grant’s Vest Pocket Trestle-Board and Working-Tools. A list of Landmarks as identified by R. W. Bro. Grant is provided on an attached sheet. In 1889, the Grand Lodge of Kentucky adopted the 4th Edition of its Constitution, which incorporated Grant’s List of Ancient Landmarks. R. W. Bro. Grant died (in office) in 1912. Several years after the death of Bro. Grant, the Grand Lodge of Kentucky directed W. Bro. The symbolism of the operative art of Masonry. Belief in the persistence of personality. A “book of law” is an indispensable part of the furniture of every Lodge. The symbolism of an operative art. That a Mason must be a man, freeborn, and of age. A study of the Landmarks does not reach a definitive conclusion as to how many exist and what their specific nature is. In reflecting upon the debate about the Landmarks, and with reference to Mackey’s four-fold test, Melvin M. Johnson, who served as Grand Master of Massachusetts from 1914-1916, commented as follows, “Probably all Masonic students will agree to this definition and then proceed immediately to disagree upon the list of those fundamentals which are to be classified as universal, unalterable and unrepealable.” M. W. Bro. Johnson’s analysis is probably the most correct statement that can be made about the Landmarks. Yet their study is of infinite interest to Masons and the source of unending, and hopefully, productive, hours of discussion. Albert G. Mackey, M. D., A Textbook of Masonic Jurisprudence, Macoy & Sickels, Publishers, New York, New York, 1859. B. Grant, Vest Pocket Trestle-Board and Working Tools, Masonic Home Print, Masonic Home, Kentucky, 1914. Book of Constitutions of The Grand Lodge of Kentucky,4th Edition, Press ofthe Masonic Home Journal, Masonic Home, Kentucky, 1893. Rob Morris, A Code of Masonic Law; Being a Practical Exhibit of the Landmarks and Usages of Ancient Craft Masonry, J. F. Brennan, Louisville, Kentucky, 1856. Coil‘s Masonic Encyclopedia, Macoy Publishing & Masonic Supply Co., Richmond, Virginia, 1961. Roscoe Pound, Lectures on Masonic Jurisprudence, National Masonic Research Society, Anamosa, Iowa, 1920. The Masonic Landmarks are unchangeable and imperative. Masonry is a system, teaching symbolically; piety, morality, charity and self-discipline. The law of God is the rule and limit of Masonry. The Civil Law, so far as it accords with the divine, is obligatory on Masons. The Masonic Lodge and the Masonic Institutions are one and indivisible. Personal worth and merit are the basis of official worth and merit. The official duties of Masonry are esoteric. The honors of Masonry are the gratitude of the Craft and the approval of God. Masonic promotion, both private and official, is by grades. The Grand Master may have a deputy. The head of the Lodge is the Master, duly elected by the Craft. The medium of communication between the head and the body of the Lodge is the Warden, duly elected by the Craft. Obedience to the Master and Wardens is obligatory upon the members. Secrecy is an indispensable element of Masonry. The Grand Lodge is supreme in its sphere of jurisdiction, and controls both the Subordinate Lodges and individual Masons, but is always subject to the Ancient Landmarks. The division of Masonry into three degrees. The government of the fraternity, by a presiding officer called the Grand Master, who is elected from the body of the Craft. The prerogative of the Grand Master to preside over every assembly of the Craft. The prerogative of the Grand Master to grant dispensations for the conferring of the degrees at irregular times. The government of the Craft, when congregated in Lodges, by a Master and two Wardens. The right of every Mason to be represented in all general meetings of the Craft, and to instruct his representatives. No visitor unknown to the Brethren present, or to some one of them as a Mason, can enter a Lodge without first passing an examination according to ancient usage. No Lodge can interfere in the business of another Lodge, nor give degrees to Brethren who are members of other Lodges. Every Freemason is amenable to the laws and regulations of the Masonic jurisdiction in which he resides, and this although he may not be a member of any Lodge. Certain qualifications for candidates are derived from a Landmark of the Order. A belief in the existence of God as the Grand Architect of the Universe. A belief in the resurrection to a future life. The book of law shall constitute an indispensable part of the furniture of every Lodge. The foundation of a speculative science upon an operative art, and the symbolic use and explanation of the terms of that art, for the purposes of religious or moral teaching. That these Landmarks can never be changed. The Ancient Landmarks of Freemasonry are the immemorial usages and fundamental principles of the Craft and, are unchangeable. Freemasonry (existing “from a time whereofthe memory of man runneth not to the contrary”), was anciently operative and speculative; it is now speculative, embracing a system of ethics – moral, religious and philosophical – and relates to the social, ethical and intellectual progress of man. Freemasonry embraces the degrees of Entered Apprentice, Fellow Craft and Master Mason, which are conferred in regular Lodges whose rites and ceremonies are private. Secrecy is an essential element of Masonry, and every Mason is bound by irrevocable ties to keep inviolate the private ceremonies, signs and words of Masonry, and the business of the Lodge, including the ballot, and (excepting treason and murder) never to divulge any accepted secret confided to him. Writing or printing the esoteric part of Masonry plainly or by sign or otherwise, is contrary to the covenants of the Fraternity. The Covenants of a Mason do not conflict with his duty to God, his country, his family, his neighbor, or himself, but are binding upon his conscience and actions. Belief in the existence and reverencing the name of the Supreme Being, whom men call God, and whom Masons refer to as “The Grand Architect of the Universe,” is unqualifiedly demanded. Belief in the immortality of the soul and the resurrection to a future life. “The Book of Law,” Square and Compasses, are the Great Lights in Masonry, and their presence in an open Lodge is indispensable. The Principal Tenets of Masonry are Brotherly Love, Relief and Truth. The Cardinal Virtues of Masonry are Temperance, Fortitude, Prudence and Justice. The white lambskin apron is the badge of a Mason. The Square and Compasses are Masonic symbols of morality. The Saints Johns’ Days (June 24 and December 27) are Masonic Festivals. The “General Assembly,” or Grand Lodge, is the supreme legislative, judicial and executive body of the Craft in all matters Masonic within its territorial jurisdiction, and is composed of representatives from Lodges therein. A Lodge is an organized body of Freemasons, having a Warrant of Constitution authorizing it to work. Every Lodge, Grand and Subordinate, when lawfully congregated, must be clothed, tyled and opened before it can proceed to work. Masons meet in the Lodge upon the level of equality, and address each other as Brother. A Lodge, duly opened, has the right to instruct its representatives to Grand Lodge. Questions of politics, or sectarian religious beliefs, cannot be brought into a Lodge. A Mason in good fellowship with some regular Lodge may visit any Lodge not his own when it will not disturb the harmony of the Lodge visited. A Mason cannot sit in a clandestine Lodge, nor converse on the secrets of Masonry with a clandestine made Mason, nor with one who is under suspension or expulsion. The Grand Master is the executive head of the Craft, and presiding officer of the Grand Lodge, by which he is elected and whose laws he must obey. The Grand Master may preside in any Lodge in his jurisdiction. The Grand Master may suspend the Master of a Lodge or arrest a Lodge charter for cause. The officers of a Lodge are the Master, Senior Warden, Junior Warden, Secretary, Treasurer, Senior Deacon, Junior Deacon Steward and Tyler. The Master is the head of the Lodge, and, as a presiding officer, governs it according to the laws usages of the Fraternity, and may convene it at pleasure. The Master must have been a Warden [except in the formation of a new Lodge, or when no Past Master or Past Warden who is competent and willing to serve is a member of the Lodge]. The Master, by virtue of his office, represents his Lodge in Grand Lodge. The Master becomes a “Past Master” at the close of his official term. The Wardens of a Lodge must be Master Masons. In the absence of the Master, the Senior Warden performs his duties. In the absence of both, the Junior Warden acts. Officers of a Lodge, Grand or Subordinate, hold their offices until their successors are lawfully chosen and inducted into office, or become lawfully disqualified. A Mason is not to urge any person to become a candidate for the mysteries of Masonry, for every candidate must offer himself voluntarily and unsolicited. Every candidate must be a man, free born, of mature and discreet age, of good morals and report, possessed of intelligence and having the natural use of his limbs that will enable him to receive and impart Craft mysteries. It is the internal qualifications of a man that recommend him to become a Mason. Careful inquiry into the physical, intellectual and moral fitness of every candidate for the mysteries of Masonry is indispensable. Advancement to the degrees of Fellow Craft or Master Mason is not to be made without examination as to the qualifications of the candidate, and by unanimous consent. Unanimous consent of the Lodge, expressed by ballot, is essential before initiation or admission to affiliation. Every Mason must be obedient to the laws of the country in which he lives or sojourns. No Brother can recognize anyone as a Mason until after strict trial or lawful information. A Mason is bound to use the utmost caution when in the presence of strangers or profanes, that no sign, token or word to which they may not be entitled shall be discovered by them. Every Mason out to belong to some Lodge, attend its meetings and share its burdens. A Brother is not to be admitted to Lodge membership without certificate [or demit], due notice and inquiry. Every Mason must patiently submit to the award of his Brethren in Lodge assembled [subject to appeal to Grand Lodge]. A Mason must be true to his fellow; instruct, admonish, defend and assist; but never traduce or supplant him. A Mason shall not have unlawful knowledge ofthe wife, daughter, sister, mother or servant of his fellow. A Mason should be diligent in business and pay his just debts. Every Mason must obey Lodge summons. The only penalties known to Masonry are fines, reprimand, suspension for a definite period, and expulsion. A Mason cannot be disciplined without having an opportunity to be heard in his own defense [unless he absconds or cannot be reached by notice]. Every [affiliated] Mason is entitled to burial with Masonic [ceremonies and] honors.